Samsung has just announced a ‘Remote Access’ feature for its upcoming Smart TV lineups. The feature will provide users wireless, on-screen control over connected peripheral devices, including PCs, tablets, and smartphones. Users can remotely control compatible programs and apps on their connected devices through their Samsung Smart TV. Earlier this year, Samsung introduced the S Pen remote features on the Galaxy Note 9. Now Samsung is embedding a similar feature in its Smart TV lineups as well. 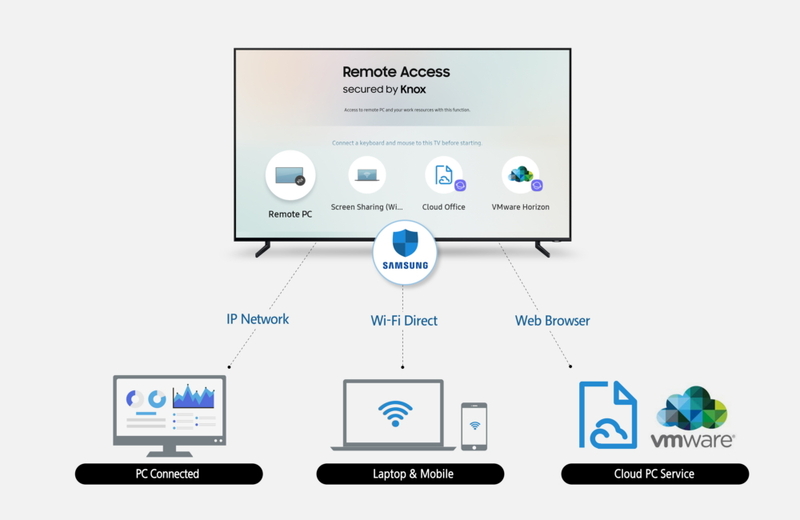 Without needing a separate HDMI cable connection, Samsung Smart TV users will be able to remotely access a PC in their room through the TV in their living room. And with a mouse or keyboard connected to the TV, they can navigate through the on-screen content and even perform various tasks including surfing the web or playing games. Additionally, Remote Access allows users to access files and work on documents from their Smart TVs with the help of a web browser-based cloud office service. So Remote Access is not only about displaying the content on a larger screen. The Remote Access feature is secured by Samsung’s proprietary Knox security technology. Samsung has been using Knox in its Smart TVs since 2015. The company provides regular firmware updates to the platform for continuous protection. Remote Access is based on VMware Horizon, a Virtual Desktop Infrastructure (VDI) solution by Samsung and its partner VMware. Samsung said the feature will be available on its Smart TVs starting 2019 and can be used anywhere in the world. Samsung may also add Google Assistant on its 2019 Smart TVs.